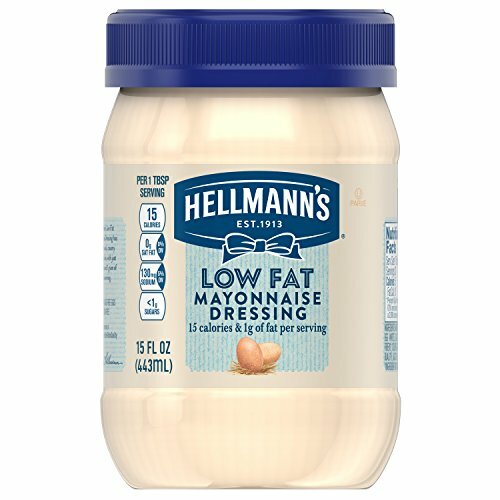 Hellmann's Mayonnaise Dressing Low Fat 15 oz - Be Happy Dieting! Lighten up meals without sacrificing delicious taste. Hellmann’s Low Fat Mayonnaise Dressing has all of the real, creamy taste you love, with just 15 calories and 1 gram of fat per serving. It’s a simple, delicious alternative to Hellmann’s Real. We use the finest, real ingredients – like eggs, oil and vinegar – in Hellmann’s Low Fat Mayonnaise Dressing. We know that to really “Bring Out The Best,” we need to do more than just taste great. Even after 100 years, we’re still committed to using premium ingredients to craft the highest quality mayonnaise and mayonnaise dressings. In fact, we’re on a mission to use 100% cage-free eggs and 100% responsibly sourced soybean oil in everything we make by 2020, and we’re proud to say we’re already well on our way. Hellmann’s Low Fat Mayonnaise Dressing is gluten-free and certified kosher. It’s the ideal lighter condiment for spreading on sandwiches and wraps, grilling juicy burgers, mixing creamy dips, and preparing fresh salads. Use it to make flavorful dishes like our Garden Chicken Salad, Mexican Pasta Salad, and more. Hellmann’s is known as Best Foods West of the Rockies. Discover our recipes, products, information about our souring, and more on our website, Hellmanns.com. Hellmann’s uses 100% cage free eggs in everything we make!